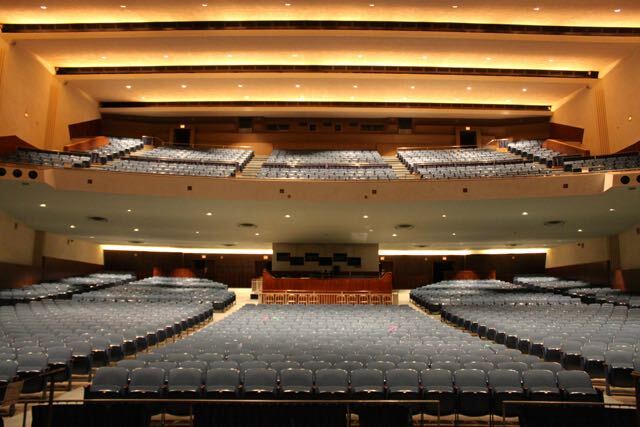 Recently, RAPA (Rochester Association of Performing Arts) invited us into their new home at the Kodak Center for the Performing Arts, previously named Kodak's Theatre on the Ridge. Not only did it give us a chance to learn about our city's past and the history of Kodak and George Eastman, but to see this building's future again here in Rochester. We all know that Kodak was a major company here, as many of us have heard it from relatives and family friends who've worked there. And they were right. When the doors opened to us at Building 28 we couldn't believe what we found...we initially felt like we stepped back through time. The colors, the wood paneling, the wallpaper, the carpets, it was like a time capsule of Kodak's heyday. Escalators and elevators to every floor. A gymnasium and employee fitness center. And a huge cafeteria with Kodak's history still on the walls. We even learned that when George Eastman developed this land he built his own power plant on the site to support his growing endeavors. See that building far in the back there? That is where his office still stands, untouched and off limits since the day he died. We saw original signs to labs, offices, and darkrooms. And many conference rooms throughout the building that are now rent-able spaces. But, as much as we love Rochester history, this post is not about the past, it's about RAPA and the future of this building. RAPA is giving this building a new life. What we saw before as empty conference rooms and a gymnasium are now rehearsal space and acting classrooms. This theatre seats 1,964 people and to fill those seats, the parking lot directly across the street from the building fits 1,400 vehicles. ...and a green room with direct access to the stage, with George always watching of course. There's even space for an orchestra! Here's another building hidden gem - a second, and quite smaller theatre, that seats 180. Imagine the possibilities. We would love to continue showing you photos of how awesome this building is, but it comes down to this: RAPA has taken on a building that's had very few occupants for quite some time. Now it's being revived and put to good use. Imagine the productions, the movies, maybe even the concerts. The Kodak Center for Performing Arts is a great asset to Rochester, thank you RAPA, for continuing to invest in the city. Now go see a show! Stefanie is co-Founder and Editor of the Rochesteriat. She has a heart for Kodak, as her dad worked there for 23 years (and even in this building!) and she can't wait to go see Mary Poppins! Find her with a camera & phone in hand, taking photos for @theRochesteriat on Instagram. Follow her on Twitter. Located on East Main Street, on "Theatre Row", you'll find RAPA: Rochester Association of Performing Arts. RAPA is "Upstate New York’s oldest and largest professional school of performing arts for all ages having served our Greater Rochester Area since 1978" (via RAPA Website). Inside you'll see the hustle and bustle of a performing arts school, as they primarily train students in theater, dance, and music. Here, students young and old, have opportunities to learn and put that learning into action on stage. On our tour we were lucky enough to sit in on a rehearsal for In the Heights, an upcoming production. RAPA holds spring break camps, summer camps, college prep workshops, and even private lessons for voice, drums, piano, and acting. From the outside you may not realize how big this building is. Inside you'll find three rehearsal and studio spaces along with RAPA's East End Theatre (with dressing rooms), and all of these are even available to rent. RAPA also partners with many area community organizations, all promoting the arts in Rochester. They love being a part of the city and being a place where diverse and different students can come together to learn from each other. Whether you're taking a class or taking in one of many amazing performances (they're also a big venue for the Fringe Fest each year!) we hope you're able to enjoy all RAPA has to offer.